(Hong Kong, 17 Jul 2018) M800, a leading global communication solutions provider in Asia, and Liana Technologies, Europe’s leading cloud-based marketing and communications software company, have started a technological collaboration to enhance both companies’ solutions and allow the creation of industry-revolutionizing products that will benefit businesses extensively. Both companies are harnessing each other’s technology solutions and strengths to enhance their own businesses in selected market areas. M800 will start using Liana Technologies’ marketing and communication software solutions globally and aims to empower its business in Northern Europe in particular. 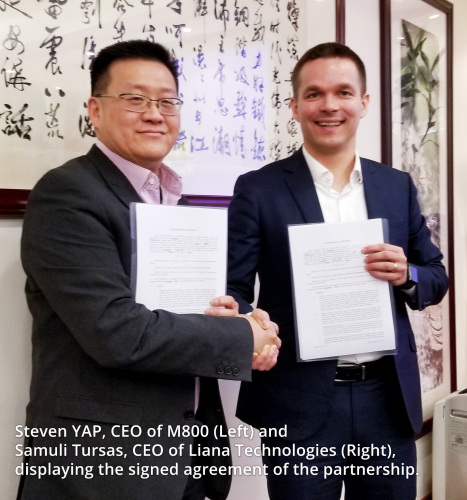 Liana Technologies, in turn, will integrate the telecom technology of M800 into its own tools to broaden its business in Asian and Middle Eastern markets. M800 is a leading global Communication-Platform-as-a-Service (CPaaS) provider which is recognized for offering reliable communication solutions through its globally distributed network infrastructure. Providing the highest security and reliability in the industry, the award-winning company offers carrier-grade communication solutions for enterprise and businesses. These include communication SDKs for Internet of Things (IoT) and apps, an integrated communication platform for customer service (liveConnect), and a white-label communication app for businesses looking to improve their internal and external communication securely. The company has over 500 enterprise clients globally, across different industries including Fortune 500 companies. Liana Technologies is the leading marketing and communications technology provider in Europe. The company provides agile SaaS (Software as a Service) tools for email marketing, marketing automation, content management, eCommerce, media monitoring and press release distribution. Liana Technologies is founded and headquartered in Oulu, Finland, but has rapidly expanded to European, Asian and Middle Eastern markets. The company has over 3500 clients including big brands like Avis, Mazda, IKEA, Jaguar, Royal Orchid Wine, Dubai Silicon Oasis, and Hertz.